Protein Porridge Pots from THE PROTEIN WORKS™ are a ground-breaking innovation that re-defines the classic porridge. Each Protein Porridge Pot is packed with over 21g of premium grade multi-sourced protein to provide a tapered release, plus over 38g of carbs to help supercharge your day. In addition, it is gluten free due to the inclusion of our premium grade gluten free oat flakes. We've also included TPW™ nutrient dense colostrum. Made as always with our acclaimed natural flavours, Protein Porridge Pots are the ultimate in convenience. Simply add hot water and consume! Our Innovative Take on the Classic Porridge at The Protein Works™ we dare to challenge the norm. We are insanely passionate about re-defining sports nutrition for the benefit of our customers. Our Protein Porridge epitomises how we constantly strive to raise the bar on even everyday classics like porridge. Not only does our latest creation include our acclaimed all natural flavours, but we have created brand new and exciting flavours for you to try. Each one includes a unique twist to make them even better tasting. Apple & Cinnamon is a subtle flavour of English apples and warming cinnamon, with 100% natural Golden Sultanas for that fruity burst. Gluten free oat flakes, protein Blend (undenatured Whey Protein Concentrate (Milk), Milk Protein Concentrate, Colostrum 30% igG (Milk) Skimmed Milk Powder, Natural Golden Sultanas, Natural Flavouring, TPW Vitamin Blend (Vitamin A, Niacin, Biotin, Vitamin D, Vitamin B12, Vitamin B6, Vitamin b1, Vitamin B2, Vitamin E, Pantothenic Acid, Folic Acid Anhydrous, Vitamin C), Sweetener (Sucralose), Emulsifier (Soya Lecithin). 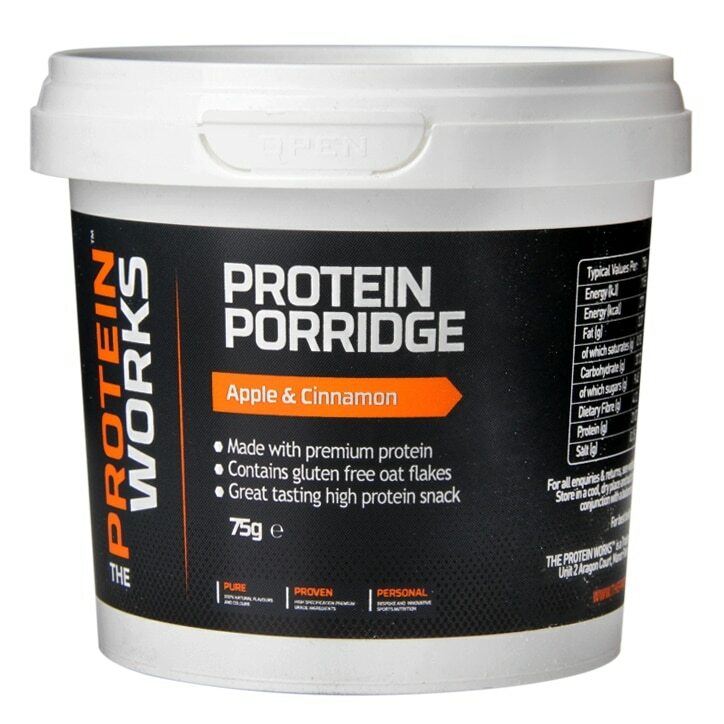 The Protein Works Protein Porridge Apple & Cinnamon is rated 2.8 out of 5 by 4. Rated 2 out of 5 by Diammeter from Very thick I couldn't eat this as it was too thick. It seems to have lots of nutrients, but not for me. Rated 5 out of 5 by Mone from tastes great The porridge tastes great and has more protein than other brands. It's very easy and quick to prepare so ideal for taking to the office.